Adolescence is often tragic, full of drama and awkward moments, as each person finds out who they are, and what they’re going to become. They live and breathe amongst people their own age, thrown in a system where they’re taught the ways of the world, clashing with other people just as awkward, just as lost, trying to take their destined social mantels. Dale Sampson is a nerd by just about every standard. He’s a social misfit, keeping to himself, unable to say the acceptable things on the rare occasions when his universe bumps into another. His over-achieving performance in school and financial failings throw him further into exile when skating by is viewed as a status of what is cool dressed in the trendiest of clothes. Girls wrangle Dale into a game where he’s blindfolded and led around the playground, forced to bump and trip into things. He takes this attention, and rather than quitting and running back into a hole to hide, allows them to run him right into a game of basketball, bumping into the class sports star, Mack. Something odd happens here, though. Rather than smashing Dale’s face in, as was the anticipated response, the two become friends as Mack tries to show Dale the ropes of social life, sports, girls, and parties. Dale falls for Regina, one half of a set of twins, and it all comes crashing down one night when Mack convinces Dale to attend a party, where Regina is supposed to be without her ex-boyfriend, and Dale’s arch-nemesis, Clint. The life-altering party shows Dale what he’s meant to do with his life. He’s able to regrow body parts. Like a salamander, if Dale were to lose a digit or a limb, it would heal faster than a normal person’s, but also grow back as if nothing had ever happened. Dale decides after high school to use this to his advantage, giving his body as a donor to those less fortunate than himself. However, rather than Dale becoming the big man on life’s campus, he recedes further into his own self-destructive darkness, unable to shake his social ineptness. 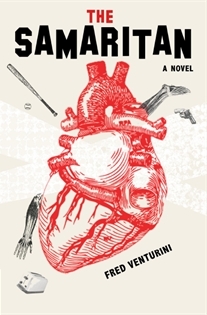 Fred Venturini’s debut novel climbs into the head of every social underdog. You don’t follow his protagonist for the ride, you remember every horrible detail. You relive the teasing, the schoolyard fights, and the dirty looks in the hallway. Fred takes you back to your teenage years and holds a mirror up in front of your face and asks, “Who were you?” Were you Dale? Were you Mack? Or, were you Clint? And rather than toeing the line of boring static characters, he rounds them out, especially with Mack. Instead of being a stereotypical jock, guzzling beer and diddling anything with a chest and a pulse, both of which he did in excess, Mack had a conscience. He was a true friend to Dale, with decisions and reasoning, that sometimes appeared to be selfish, but often there was a reason for everything, and it was with Dale’s best interest at heart. Blank Slate Press is a small publishing company that focuses its stable of authors to the St. Louis area. If Venturini is any indication of the talent coming out of the “Show Me” state, then perhaps I need to take a better look of what is going on over there. Perhaps I should take a sip out of the Mississippi River, or something. There isn’t a whole lot to the prose, but it is quick moving and keeps you interested. What keeps you coming back for the next chapter, for one more page, are the characters and their story. Venturini writes like he has mileage, and that’s a road trip that should be caught every time he gets published. This entry was posted in Reviews and tagged Blank Slate Press, Fred Venturini, The Samaritan. Bookmark the permalink. Hey Sean, thanks for the review–I saw it pop up in my Google Alerts today (I’m with Blank Slate Press). Although we’re St. Louis based, we’re open to publishing the best writers in this region, which is a good 300-mile radius around St. Louis. And we require all of our writers to drink one cup of the Mississippi River’s magical, muddy elixir once a day, of course.